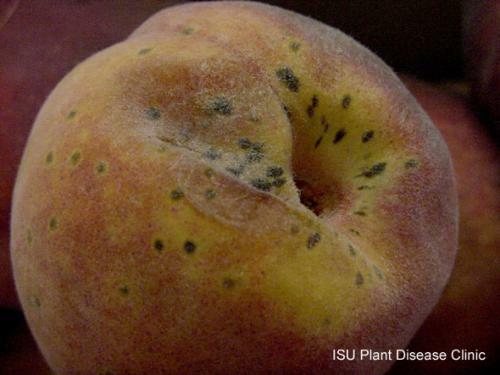 Peach scab is a fungal disease that causes small, greenish round spots to appear on the peach fruit, often more concentrated at the stem end. As spots age, they may become black and velvety, and heavily infected fruit may be deformed or cracked. The Iowa State University Plant & Insect Diagnostic Clinic can help you to investigate and confirm if you plant has this disease. Please see our website for current forms, fees, and instructions on collecting and packing samples. Contact information for each states diagnostic laboratory for U.S. residents can be located at the NPDN website. If you have a sample from outside of Iowa, please DO NOT submit it to the Plant & Insect Diagnostic Clinic without contacting us. Fungicides may be used 10 to 12 days after the shuck split stage of bud development, for about six weeks. What are the black spots or blotches on my apples? There are black spots on the surface of my apples. Can I eat the skins?